After getting knocked out from one cup competition Chelsea advance to the final of another, beating Liverpool 1-0 in the second leg and 2-1 on aggregate thanks to a Branislav Ivanovic header in extra rime, while Diego Costa did everything in his power to get sent off but somehow stayed on the pitch for the entire 120 minutes. 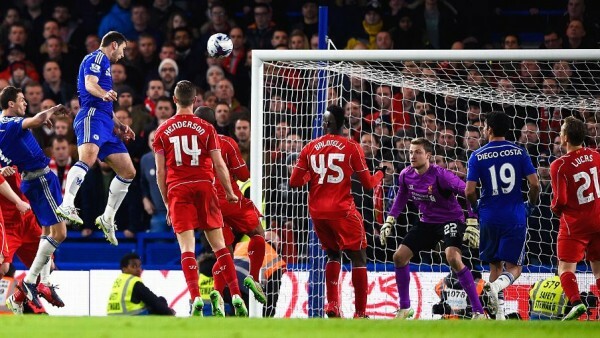 Carrying a 1-1 draw from the first leg of the League Cup semifinal at Anfield, Chelsea had the privilege of not being forced to score. Through the first 45 minutes, they certainly didn’t seem like a team too hard pressed to find a goal. Liverpool’s system made it very difficult for Cesc Fabregas to make any kind of contribution, while Thibaut Courtois was once again the best player for Chelsea during the first half. Mamadou Sakho leaving the pitch due to an injury changed everything. Liverpool conceded their formation and shape, which made it a lot easier for Chelsea, especially through the side Glen Johnson was supposedly marking, get very easy chances for themselves. Simon Mignolet has been often criticized for his performances this season, but Liverpool were able to reach extra time without conceding a goal mostly thanks to him. As for Costa? He twice deliberately stomped on Liverpool players – once on Emre Can at the beginning of the match followed by Jose Mourinho having words with Martin Skrtel, and later in the match on Skrtel himself. On both occasions he wasn’t penalized. He did get a booking later on for an altercation with Steven Gerrard. Chelsea didn’t only enjoy referee decisions. They deserved two penalty kicks that weren’t called – one hand ball by Lucas in the first half and later due to a foul in the penalty area. Overall, the two legs were quite evenly matches, but with Liverpool finding it so difficult to convert their chances (a problem they’ve been having all season), one mistake in marking on a corner kick took them out of another competition.